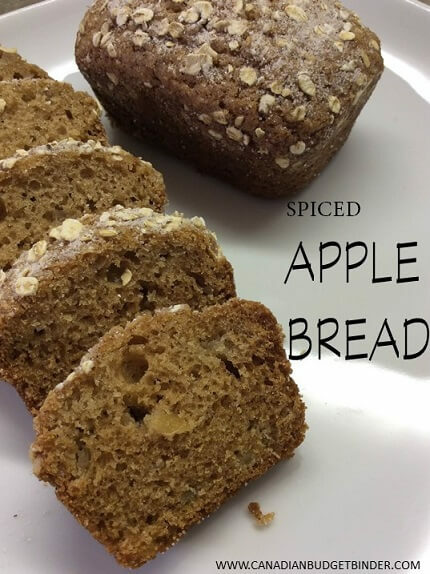 If you are looking for apple recipes you’ll want to add this spiced apple bread to the menu this week. Apples are everywhere in September especially at the farmers markets where you can buy bushels of them for a reasonable price. Also, with the Fall season around the corner apples are waiting to picked from the trees so now is a good time to harvest them. Now that the leaves are falling to the ground and seasons are changing this spiced apple bread is the perfect dessert. Quick breads have long been a favourite in many households not only because they are easy on the budget but they are fast to make. I’m a huge fan of apples and since I had a spare can of apple pie filling in my pantry I decided to create this spiced apple bread. Typically I would make my apple pie filling or apple sauce which you can do or you can use this shortcut that I’m taking to use up a pantry item so it doesn’t go to waste. If you don’t have apple pie filling in your cupboard like me you can easily substitute with a homemade spiced apple sauce. Mr. CBB has a wonderful Rhubarb Cherry Apple Sauce that would be perfect for this recipe to change it up. Making apple sauce is so easy. All you do is cut up some apples, add a bit of water to a saucepan, sugar, spices and let it reduce. It will happen fairly quick and before you know it you will have a spiced apple sauce. Now that the bountiful gardens of Fall are upon us that means I am busy pickling, freezing and canning so we are stocked up for the winter months. I am very thankful to all my friends who know that I will take any fruits or vegetables off their hands when they can no longer handle the harvest of their own gardens. We have already dug up potatoes and onions from our garden and are awaiting the turnips to get their first frost. After the first frost turnips are at their sweetest and perfect to eat and harvest. This week I received a huge box full of corn and cucumbers from my friends mother. I will have my hands full freezing and pickling but it’s worth it not only for our grocery budget but to get the taste of summer through the winter months. I have even started on harvesting the parsley and basil too just like Mr CBB, nothing goes to waste. This spiced apple bread recipe is great for a snack or to be frozen for a later date when you get unexpected guests at the door on those cold winter evenings and they need warming up. I like the apple bread for the kids breakfast along with a nice hot mug of hot chocolate or to pack in their lunch for school. It’s a nice change for the family instead of having cereal or a cooked breakfast. Apple Bread is very moist because of the apple pie filling and full of flavour because of all the amazing spices I use in this recipe. Best of all, it won't cost you much to make it. Beat egg, apple pie filling and mayonnaise in a large bowl with whisk until well blended. Mix remaining ingredients in a separate bowl. (except the toppings ingredients). Add to Apple filling mixture, stir until just moistened. Grease baking tins and pour mixture in. Mix all of the topping ingredients together and lightly sprinkle on top. If you are using loaf tins bake for 1hr. If you are using the mini pans cook for ½ hour. Let cool slightly for about 10mins then place on cooling racks. Once completely cooled these can be placed in freezer bags and frozen until needed. The best part about making apple bread with all of these wonderful spices is the aroma that spreads throughout the house. You won’t be disappointed and you’ll be drooling just waiting for a slice. What other spices would you add to your apple bread recipe? Thanks for this great recipe Nicola. 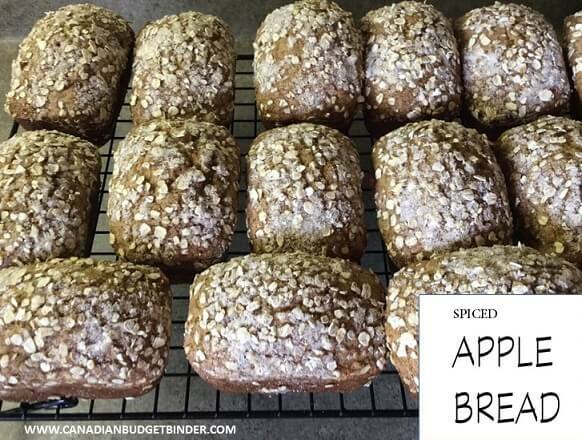 I’m sure this spiced apple bread is very delicious. This looks so yummy Nicola!! Two quick questions, the larger loaf tin would be the 9X5 pan to make two loaves and what spices and how much plus how much sugar do you add to your apple sauce? When I make apple sauce here it’s just apples cooked in a touch of apple juice and mashed. I have a very picky eater here. Christine, I usually do nutmeg and cinnamon and i just add a little at a time until it tastes good. It’s the same for sugar. As the amount of apple sauce I make varies depending on how much apples I can get my hands on!